Mark Warburton tried to deal with the fall out from the Old Firm game by looking back to his days as a City trader for inspiration. Maybe he's right that it will take time to recover - after all, even a 10-0 thrashing of Ross County would not have completely placated a fanbase humiliated by the debacle at Celtic Park. But in the end, despite the manager's assertions that it was his team's best performance of the season, Rangers didn’t even come close to thrashing the Highlanders, although they certainly deserved to win the match. Not that the support appreciated that, given the round of boos at the final whistle. Some football matches can only be assessed in the context of the games that preceded it, and this was a prime example. 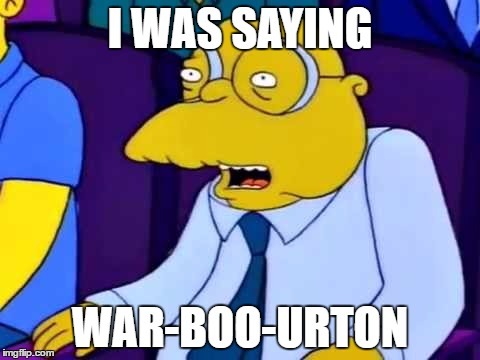 Sure, Warburton was right that there were positives to be taken. His side looked so much more energetic (is the absence of Joey Barton a coincidence? Ed), with Josh Windass again a real standout. A young side playing a high tempo, able to overwhelm middle-to-lower ranked teams, and, if the defence improves - far from a given - capable of dangerous counter­attacking against the better sides - maybe this is all that Rangers can, and should be, realistically aiming for, right now. As of half-time yesterday afternoon, this piece was going to be a massive rant about how Don Robertson had lost his bottle and cost Caley Thistle any chance of a result (when I did moan on Twitter, a number of Celtic fans reminded me of a Tweet after Meekingsgate where I claimed bad decisions evened themselves out over time!). Then Celtic were so dominant in the second period that I went away suspecting that, had Erik Sviatchenko been sent off, the ten men would have probably been well on top anyway. That they didn't win by a cricket score was down to a combination of factors; an incredible performance from ICT keeper Owain Fon Williams; some terrible finishing; and some sort of flipping miracle. So complaining about the foul on Draper seemed like pushing one's luck. Both Brendan Rodgers and the Celtic support treated this result with a "well, you can't win every game" reaction - the sort of response you can only make when you're absolutely certain you're going to stroll the league. And quite right too. Results like this will be few and far between; a lot of teams are going to get a proper thumping this season. The visitors showed no signs of physical or psychological fatigue from their catastrophe at the Camp Nou; whilst Inverness - helped by a screamer from Billy King that levelled things up in the first half - pretty much matched them in the opening 45, the second half was a relentless onslaught. The patterns of passing and the variety of chances created were extremely impressive; had I been a neutral, it would have been great to watch. Through the gaps between my fingers, not so. The speed of movement and speed of thought is so far above that of any other Scottish team...and well last year's Ronny Deila vintage too. This weekend journalist Graham Spiers questioned whether Derek McInnes would be able to maintain momentum at Aberdeen, citing their visit to Dens Park as looking "ominous". The criticism hasn't been reserved to mainstream media, either; deep into the second half of this contest, with the match petering out to yet another draw for both sides, calls were also coming from social media for the manager to make changes and show that he actually wants three points. Derek duly made a double substitution; off went Adam Rooney and Niall McGinn - both of whom had admittedly quiet afternoons - and on came summer intakes Jayden Stockley and Wes Burns. Both substitutes obliged their boss; Stockley stuck his bonce on the end of a Jonny Hayes cross from the right to put the Dons ahead, then Burns burned into the box before being bundled over by Julen Etxabeguren to receive a fortunate decision from referee Steven McLean for a penalty kick, which Kenny McLean was just as lucky to score, after smashing his shot off the underside of the crossbar. Prior to that, Dons fans were at least treated to another classy display from Derek's most recent loan acquisition, James Maddison. Billed as a brilliant player with superb technique on the ball, he didn't disappoint - punctuating a man of the match performance with a great strike from just outside the box to draw the Dons level in the first half; albeit, Scott Bain must have been disappointed not to have kept it out. That the visitors had to draw level in the first place was due to an even better goal from the Dees; Paul McGowan threaded a through ball to Nick Ross, whose deft flick set up a Kevin Holt line drive to open the scoring. Louis Moult, Motherwell's four goal hero against Accies, has scored seven times in his last two hours on a football pitch. That's a hell of a strike rate, and one he won't be matching for long; the Englishman is a bit of a streaky striker, who hadn't scored in his last seven games of last season and who last season had several barren periods interrupted by brief goal gluts. In addition, he won't play against many defences worse than this. Each of his three open play goals - a hat-trick in the opening 21 minutes - were well taken but all were handed to him on a plate. Accies right-back Grant Gillespie will have nightmares about the way Moult kept coming inside from his starting position on the left flank; Gillespie was left for dead as the forward raced onto Ryan Bowman's flick for the opener, and was easily beaten in the air for the second. Gillespie looked like a fish out of water, and that's because he was - he's so much more comfortable in the centre of midfield. So too Darren Lyon on the other flank, who was skinned for the second and third goals and gave away a dreadful penalty early in the second half before being hooked. Changing formation at 3-0 makes one think 'barn door, horse, bolted', but remarkably Martin Canning's move to a back three nearly dragged his side back into it, with the outstanding Ali Crawford getting one back and then hitting the post shortly after. And after Crawford's second goal dragged the score back to 4-2, Craig Samson's goal was peppered. The best plan when you have no natural full-backs appears to be not to play with any. If Killie stay up, it will be because of their strikers. Kris Boyd somehow wriggled away from three Partick Thistle defenders to score his third league goal of the season; Souleymane Coulibaly later headed home to match his strike partner's total for the campaign. Six goals between them in six league games; if they were to get close to keeping that up for the remaining thirty-two matches then they won't go down. Easier said than done, of course. And if they do go down, it'll because of the problems at the other end. Lee Clark still doesn't know his best back four - he's used seven different players in defence already this season in the league and still has three summer signings to try in that area. Both Thistle's goals were poor ones to concede. Zander Clark's return to the starting lineup last week was more down to luck than anything else. Tommy Wright's decision to keep faith with veteran Alan Mannus at the start of the season had been largely justified by the Ulsterman's performances, but a sickness bug allowed Clark to get back in to the side and the 24 year old vindicated the decision to stick with him against Hearts with a sensational performance. One stop from Jamie Walker was particularly stunning, but at times he seemed to be repelling the Jambos single-handedly.